SparkPost’s API-driven email delivery service empowers marketing campaign solution providers to focus on their competitive differentiators instead of being distracted by the complexity of managing email infrastructure and deliverability. And SparkPost is focused on what we do best: getting email to the inbox, not trying to compete with our marketing solution partners. Marketing innovation and customer expectations are moving faster than ever, and the need for a reliable technology partner has never been greater. Marketing technology companies building for growth can’t depend upon other infrastructure providers with aging data centers and competing business models. Maintaining email infrastructure is resource-intensive and is a distraction from developing core differentiated value for marketing campaign solutions. That’s why partnering with SparkPost is a better way. 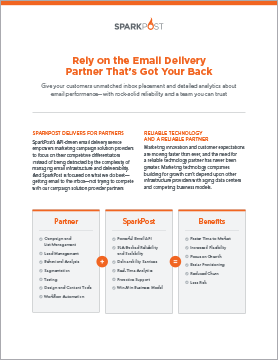 Learn why SparkPost delivers more for our marketing campaign solution partners. Download this solution brief today. Start investing in growth, not infrastructure. It’s time to offload email delivery to the cloud. Contact us today to learn how SparkPost for Service Providers helps you do more.